WCLT - Nature Notes 1/7/2005 - Think you know nature? 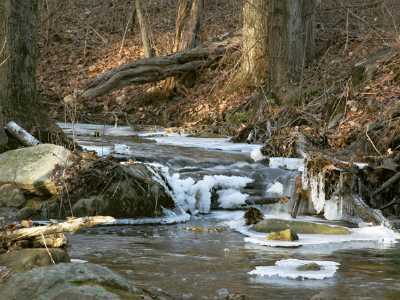 Winter in Westborough: Ice forms on a stream at the Bowman Conservation Area, Christmas Day 2004. When you're hunkered down in the house, hiding from the cold, what can you do to escape winter and turn your thoughts to warmer and greener days? Take a nature quiz. The main quiz below is a matching quiz. First is a list of of 13 phrases from the Nature Notes columns published in the News in 2004. Match the questions with a list of possible answers that follow, mostly names of plants and animals in Westborough. If you're feeling ambitious, next try the "extra credit" part of the quiz. The answers that go with these last seven questions are not necessarily listed among the possible answers. It survives the winter using a kind of biological "antifreeze". It's brightly colored and poisonous. Its seedpods are fun to pop. It hunts from up high. It might be useful in mental health. Its flowers are the last ones in the woods in the fall. It's a notorious invasive species. It's a native holly in our wetlands. What is the old English word for plant? Which creature's young develop into males or females depending on the temperature of their environment? What is Westborough's distinguishing natural feature? What do you call a landlocked pool of standing water that serves as a spring breeding ground for some kinds of frogs and salamanders but then usually dries up during the summer? Which plant produces male flowers when young, female flowers (and berries) in its prime, and male flowers again when it's old? From whom did early settlers in New England learn medicinal uses of native plants? Go to Answer Key on page 21.